Really nice construction, too bad it is so slow! Please replace the microcontroller! Next step: Hashing and indexed storage of each LEGO piece for future automated retrieval. Do you know if they are using stock firmware, or Lejos? That is a beautiful device. And a soft AI to generate new designs for lego creations. Resistance is futile. The part missed in the review above is that it sorts by not only shape, but also by weight. So if you were looking at a 1×6 block from above (dots-up), you could check the weight to tell if it was standard thickness (3x plate thickness) or just a plate. 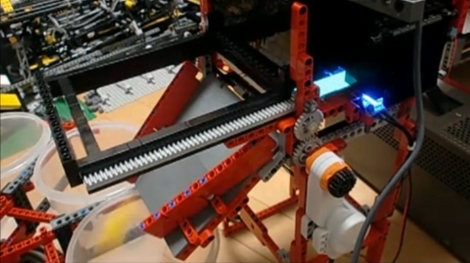 It’s theoretically impossible for something built with Lego to pull Lego pieces apart – the force required would just as likely pull the parts of the machine apart. I bet a BlendTec could help out in that department. har har har… meh. Really though, a non-destructive (read: no cutting edges) and low-power chipper-shredder/thresher-type machine would work as a first stage in disassembly. Don’t know about smaller clumps of LEGO though. Child labor?